Finding the right candidates to fill your open positions is no easy task, especially when you’re operating on a limited budget. 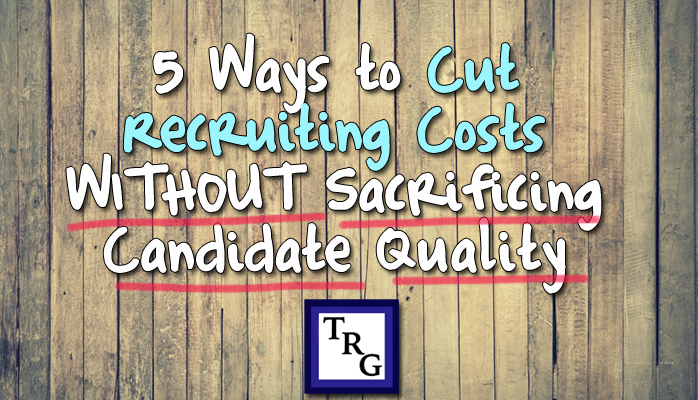 The average cost-per-hire hovers around $4,000, with turnover rates of 19%. And fierce competition for quality talent means the best candidates may be considering several different employers before they take the plunge. Automate as much as possible. Automating workflows like application follow-ups, candidate emails, social messaging, and reporting frees your recruiting staff up to focus their attention on more productive activities—like networking and engaging with candidates. Build your online recruiting presence. Recruitment marketing and social media marketing have earned a prominent place in the recruiting process. Almost 80% of job seekers look for new job opportunities or employer information on social media. Your company job page and mobile site also provide essential information for candidates as they apply. In order to reach those candidates, you need a strong online presence that supports your employer brand and engages with prospective candidates. Invest in the right technology. Your applicant tracking system (ATS) can be a huge help as you sift through resumes, screen candidates, and schedule interviews. By reducing paperwork and automating repetitive activities, technology can help you conserve time and resources while also streamlining the candidate process. Hire the right people the first time. When the person you hire isn’t a good fit for your company or the position, you can expect high turnover rates. And that means escalating recruitment costs. But when you take the time to screen for cultural fit in addition to credentials and skills, you can extend your average tenure and reduce hiring costs over time. Outsource—Staffing firms have access to an extended network and resources that can reduce both cost-per-hire and time-to-fill. Outsourcing helps you make the most of your resources by delivering quality candidates on your timeframe and budget. In addition to these five steps, take the time to evaluate your company culture and engagement strategy. Happy employees will stick around longer and be more productive, so it’s worth evaluating your current practice to discover how you can create a supportive and enjoyable work environment. At TRG, our goal is to understand your business and your culture so that we can recruit top quality candidates who integrate seamlessly into the context of your company. Contact us today to find out how we can help you unlock your potential with quality talent.